It’s official: The provisional result of Iraq’s 30 April general election, published last month, has been certified by the federal supreme court. In the IHEC statement to this effect, there is a caveat. 4 seat winners have not been approved, and won’t be approved until they have been cleared of charges relating to serious crime cases against them. Pending settlement of the court cases, their membership in parliament will remain pending, and no replacement deputies will be appointed. Whereas this may sound somewhat messy, it is actually what happened also in 2010, when 2 seat winners were provisionally excluded. Back then, it took longer for parliament to reconvene than for the judicial authorities to settle one of the cases (and one candidate was voluntarily substituted by another candidate from his bloc), so no procedural problems emerged. With the general political climate in Iraq approaching boiling point, questions will inevitably pertain to the political affiliations of those 4 that were excluded. 3 of them come from a single list, the Sunni, pro-Nujayfi list that ran in Diyala province: Salim al-Jibburi, Raad al-Dahlaki and Umar al-Humayri. They have all been in various forms of conflict with Prime Minister Nuri al-Maliki, and Jibburi (once an Iraqi Islamic Party member who cooperated with the first Maliki government) and Humayri (ex governor of Diyala ousted by Maliki allies) most bitterly so. Still, before running to conclusions about another politicized court decision in Iraq, consider the fourth excluded candidate: Abbas Jabir al-Khuzaie, a seat winner in Qadisiyya province for Maliki’s own State of Law list. Khuzaie is a local politician from the Qadisiyya council who was once with the secular Iraqiyya before defecting to State of Law in 2011. He was then with the Independents bloc of Hussein al-Shahristani and may still be a member of that bloc subunit. Still, despite ongoing internal rivalry in State of Law, it seems unlikely that Maliki would fabricate an exclusion from his own rank in a situation where the loyalty of every new single Iraqi deputy is meticulously being monitored in the contest to form the biggest parliament bloc and supply the next premier candidate. The certification of the election result opens the door for government formation: The Iraqi president (or his acting deputy) must issue a call for the Iraqi parliament to convene within 15 days, i.e. at the end of June. Theoretically, parliament will then elect its speaker, and, within a month, a new president who will then charge the candidate of the largest bloc in parliament to form a government. For Iraqi politicians, despite the current crisis, the parliamentary government formation process is likely to remain the main political track going forward. 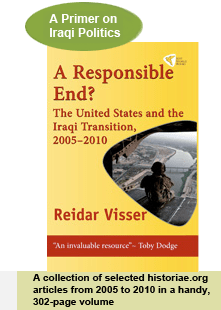 It is a problem, therefore, that much US rhetoric on conditions for aid to the Iraqi government seem focused on ideas about some sort of national reconciliation initiative that would precede the delivery of further assistance. It is very hard to see how that would fit in with the Iraqi government formation logic. Whereas there has been much talk among Americans about imposing conditionality on future military assistance in Iraq, US rhetoric has been disconcertingly void of specific proposals for measures that would satisfy them. On the other hand, there is no lack of American suggestions for favourite cabinet line-ups that could be imposed, possibly even with Iranian support. Some of this thinking seems to belong to the era of the CPA in 2003–04, rather than in today’s situation. Meanwhile, ISIS continues its savagery, the Kurds consolidate their quasi-independence, and Maliki for once actually has an excuse for drumming up state-of-emergency rhetoric. In the middle of the long wait for the certification of the Iraqi election result, speculation about the viability of PM Nuri al-Maliki’s bid for a third term has intensified. One of the recurrent questions concerns possible challenges to Maliki from within his State of Law coalition, especially from deputy PM Hussein al-Shahristani, who according to some sources has increased his influence because of the election result. A frequent contention is the idea that the Shahristani bloc should have received no less than 33 seats in the latest election, making it the biggest bloc in State of Law – ahead of Badr and with double the seats as Maliki’s own Daawa party faction. Whereas observers are right in pointing out the potential significance of a big Shahristani win, there are some problems with these rumours. Firstly, they are exactly just rumours: Nowhere has a list of these alleged new Shahristani deputies published. On the Facebook page of the Shahristani bloc it is virtually impossible to find any article that does not focus on extolling the virtues of the personality of Shahristani himself. For its part, the party’s homepage shows a list of deputies from the previous parliamentary session. In fact, most reports about Shahristani’s ascendancy seem to go back to a claim made by Hassan al-Sunayd, a former Maliki ally who lost his seat in the election and in one interview shortly after mid-May said Shahristani had won 33 seats. Sunayd is reportedly estranged from Maliki and in the process of establishing a new political party. While the possibility of a large Shahristani bloc in the next Iraqi parliament should not be rejected out of hand, a search of some of the constituencies for which coalition sub-entities are specified makes you wonder who exactly these 33 Shahristani deputies are. They do not appear to be in Basra, where a good State of Law source indicating bloc affiliation exists, and where most of the Shahristani candidates appear to have lost. (Additionally, frequent acting minister for Maliki Safa al-Din al-Safi left the party and ran independently: He received no more than 1,500 votes). Recently, other lists from Wasit and Baghdad have also been released, showing only 3 Shahristani deputies in Baghdad. The Baghdad list is particularly important since it concerns no less than 30 deputies, most of whom appear to be independents. It can be controlled independently against an analysis of the Badr winners in Baghdad, with which it squares 100%. So where exactly is this monster Shahristani delegation of 33 deputies? Not in Basra, not in Baghdad (4 deputies at most) and not in Wasit as we have seen. Other known Shahristani deputies include one in each of Maysan, Dhi Qar, Najaf and Karbala. That’s eight. Where are the rest? They surely aren’t in the Shiite-minority provinces, where all the factional identities of the State of Law winners are known. Are there really 25 Shahristani partisans hidden in the new parliament contingents from the mid-Euphrates areas? That’s hard to believe. Remember that many members of his bloc in those parts lost their existing seats, including some embarrassingly prominent cases (like Khalid al-Attiya, once a deputy parliament speaker). What can explain these major discrepancies? Semantic problems should not be ruled out, as they have appeared in the past as well. Shahristani’s bloc is named Independents (Al-Mustaqillun). That is the same term that is used for an unaffiliated MP, although the latter terms is always used in the singular and mostly without the definite article (al-). Thus, in parliament lists of members of the National Alliance in the past, some formally independent and unaffiliated State of Law members were listed as (mustaqill or mustaqilla as an adjective that is conjugated in accordance with the gender of the MP), whereas members of Shahristani bloc are listed with the bloc name (Al-Mustaqillun). It is thus very easy to mix up the two categories and erroneously add truly independent MPs to the Shahristani bloc. Pending the publication of the names of the new Shahristani bloc, this kind of explanation should not be ruled out. Once things get published by Arab newswires – often with sources far removed from Iraqi realities and with anti-Maliki voices prominent – they tend to get repeated endlessly. By way of example, in 2012 some of these sources persistently insisted that 164 (rather than 163) MPs constituted an absolute majority in the then 325-member parliament. Of course these questions are also bound to have an impact on larger issues. As an alternative to the various majoritarian constellations that are being discussed, a return to the old model whereby an enlarged Shiite alliance essentially decides the PM and then invites Sunnis and Kurds in to form an oversized partnership government – arguably the antithesis to Maliki’s political majority concept – is also receiving much attention. Clearly the question of finding a replacement for Maliki inside State of Law (a parallel to the sidelining of Ibrahim al-Jaafari in 2006) is correlated to the question of the relative size of the coalition subunits: In the internal Shiite alliance contest, political elite relationships count more than the popular vote. For example, in a fascinating image of an Iraq between majoritarian and consociational democratic models, Maliki with 720,000 personal votes is being challenged as PM candidate by people like Ahmed Chalabi with 10,000 votes. Shahristani is also in that segment of around 10, 000 personal votes. However, unless the rumours of his new-won mega contingent of parliamentary deputies are accurate, it seems highly unlikely that Shahristani should be able to upend people like the well-connected Chalabi or, for that matter, the highly popular Maliki.